Business Spend Management (BSM) technology is the smarter way to manage your spend, and it’s here to stay. If you’re not managing your spend, your spend is managing you. And if you’re at the mercy of your spend, paper invoices pile up, suppliers overbill, and risk of noncompliance and inaccuracy compounds. Resources circle the drain while you strive to stem the flow. Sound familiar? Leaders in the Financial Services industry know better than anyone that risks must be managed appropriately and accurate data empowers you to do that. You must be able to see and control what’s going on inside your organization to take back the reins and manage your spend. 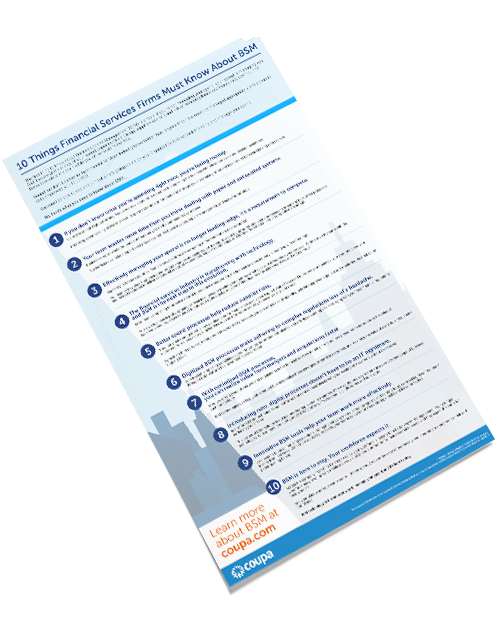 Download 10 Things Financial Services Firms Must Know About BSM, and take charge of your business spend.